Good Morning! …Or afternoon…or evening… or whenever you read this. I think I am the worst breakfast maker around. Don’t get me wrong, I can cook a decent meal, but the thought of whipping out a frying pan, before I have even finished my coffee makes me grumbly. So on a weekend when I am not rushing out the door, either one of two things usually happens. A: I don’t eat breakfast until around 2:00pm, and by that time, I am starving, and eat most of the contents of my fridge. Or B: I was clever enough to make something ahead of time, and just grab that. Well here is plan B. The much more sensible plan. In fact, if you are smart enough to be a morning person, you could even make these the morning of. The bars just need an hour of freezing time. Why freezing? Well because they are no bake energy bars. 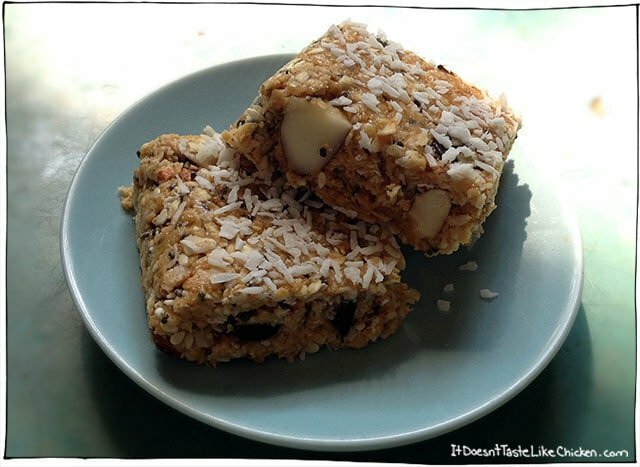 Just a bunch of fresh nuts, seeds, oats, coconut, peanut butter, and all sorts of deliciousness squished into one delightful bar. 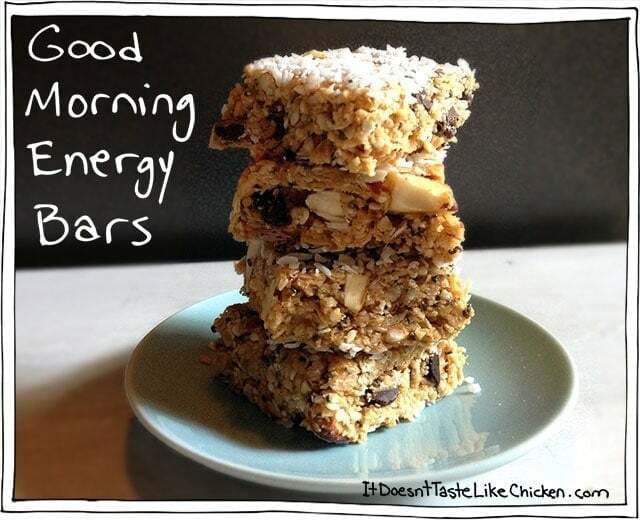 Good Morning Energy Bars will do just as they promise, make your morning good, and full of energy, and…er…in a bar shape. For the Oats, if you are gluten free, use gluten free oats. 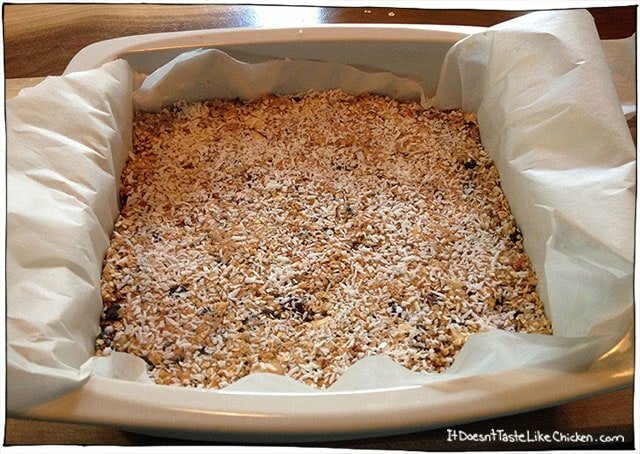 If you have rolled oats, use rolled oats. 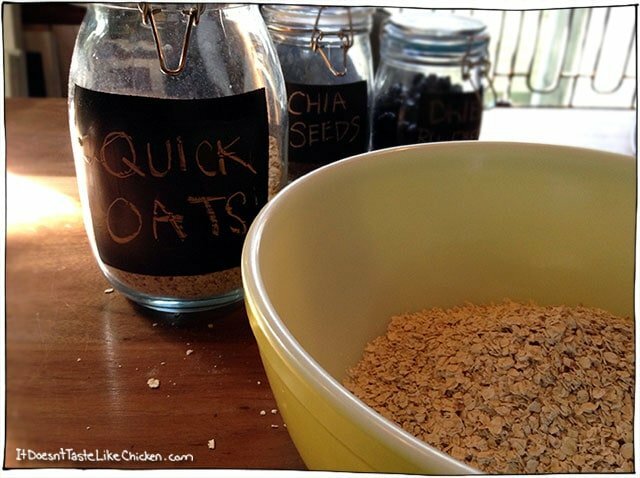 If you have quick oats use quick oats. Because we aren’t baking this, the texture doesn’t matter so much, use what you have! If you prefer different nuts, then use those instead, just keep the ratios the same. Toss all the dry ingredients into a bowl, and stir it up, little darlin’, stir it up. Oooo OOohhhh ooOOhhhh Oooooh ohhhhh! (If you aren’t a Bob Marley Fan, I may have just confused you). Add your wet ingredients and stir it up, little darlin’…. ok, ok enough of that. Now that you probably have the song stuck in your head, you should totally turn up the reggae and dance around your kitchen. Or go back to the recipe and mix in the wet with the dry. Give it some elbow grease, you really wanna make sure it’s mixed up very well. Once it is mixed, line an 8″ x 8″ pan with parchment paper. 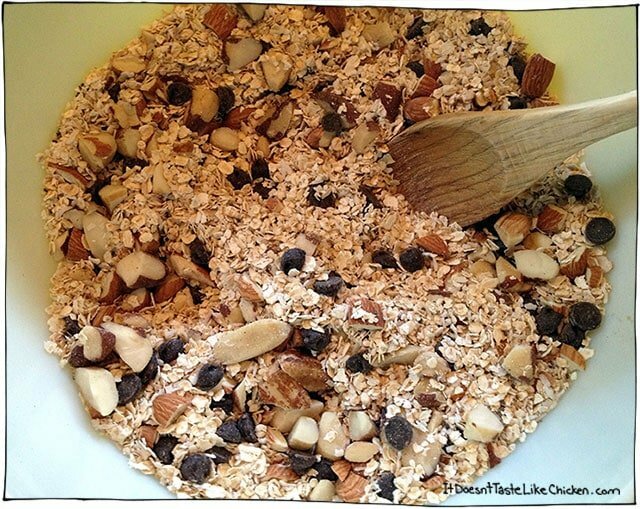 Dump your mixture into the pan, and use a spoon to evenly spread the mixture around. Then use a spatula to give it a good firm patting, so the bars will be solid and hold together. Sprinkle a little more coconut on top and pat that down. This just helps so that it doesn’t stick to your fingers when you are eating them. Pop the dish in the freezer for an hour or two to firm up. When firm, use the parchment around the sides of the bars to lift the entire batch out of the pan. Then flip it onto a cutting board, so that the bottom side it up. Sprinkle that side with some coconut and pat down too. Use a big knife to cut into bars. Store in the freezer in sealed containers, and eat straight from the freezer. (If they get too warm they get gooey). Its great to have a batch in the freezer, then you always have a yummy breakfast or snack on hand, and avoid the morning grumbles. 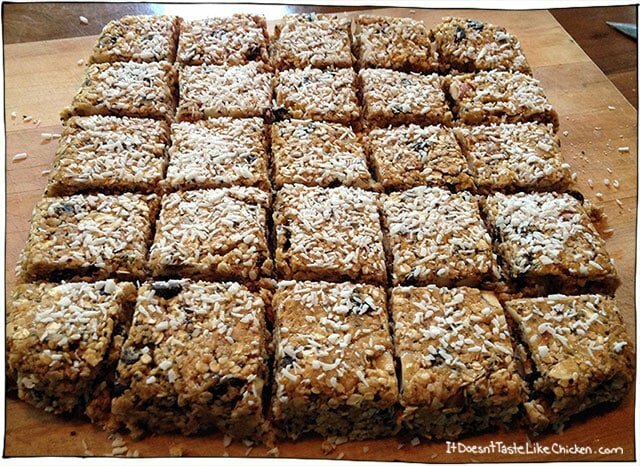 this is a great recipe and i made it but my bars didnt come out like your pics at all:(. i had a lot of crumbs that almost looked like granola for yogurt… which isnt a bad thing but its just not a bar like output. what can i do diff? or rather what did i not do right. I suspect that the low agave, or in this case honey, would be the culprit, as that is part of the “glue” that holds them together. 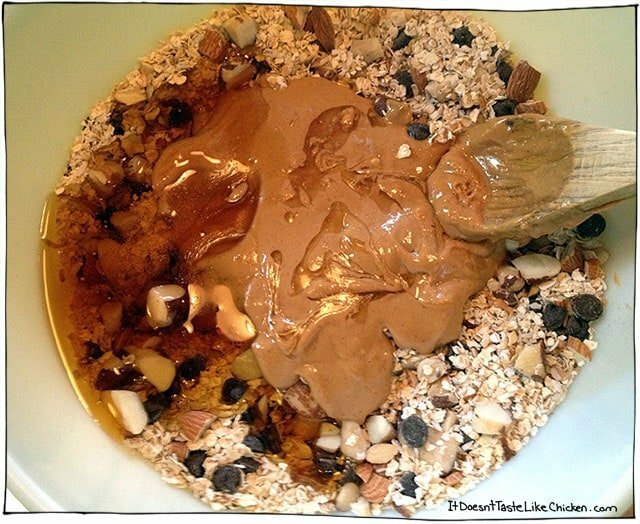 Maybe try upping the nut butter, so that in total you use the same amount of liquids as the recipe. You could see if that works. I’m glad you liked them SD. I do not eat grains such as oats, wheat, etc. Any substitution ideas…maybe flax seeds, pumpkin seeds, and hemp seeds in place of them??? Hi Marlana, I’m not sure. Oats are absorbent and provide a softer chewy texture. Is there something that you normally would replace oats with? Are you gluten free, or avoid all grains? Thanks! They are indeed pretty darn tasty…I had three today! Glad you enjoyed the “untuna”!